This geometry practice question appeared as a part of the quantitative reasoning or aptitude section of the TANCET 2008 MBA. Question 9 of a total of 20 questions that appeared in this section in TANCET 2008. This one is a medium level difficulty question and tests the following concepts: area of triangles and Pythagoras Theorem. 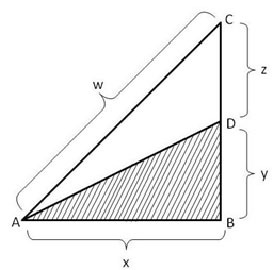 The area of triangle ABD is half the area of triangle ABC. Both triangles have the same base AB. So, the altitude BD of triangle ABD will be half the altitude BC of triangle ABC. AD is the hypotenuse of the triangle ABD. The correct answer is Choice (4).